The Osage sound is an amalgamation of musical influences such as deep house, samba, African rhythms, futuristic r&b, boogie, uk garage, salsa, broken beat, and soul. Built from slightly unorthodox drum programming, and layers of synthesizers, the music is focused on bringing the soulfulness out of the machines he is working with. Over the years, he has been building a solid reputation by creating a catalog of clever dance floor edits, remixes, and original tracks which have been supported by notable tastemakers such Gilles Peterson. 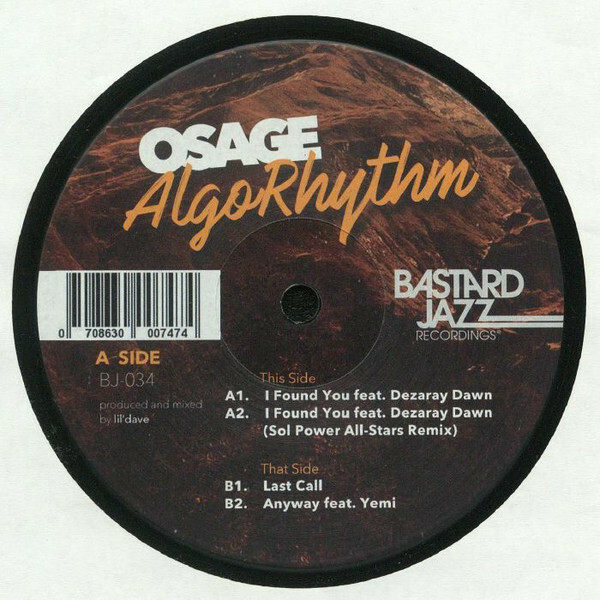 With Osage’s second EP, AlgoRhythm Vol. 2, you will hear him expanding his sound into directions outside of your typical four on the floor dance rhythms. On the handclap driven “Anyway”, he melds electronic elements with a soulful piano section (played by Wale Owoade) while the gentle voice of Yemi sings about chasing dreams. As the EP continues on, the carefree vibes of “Right Now”, which features singer/flautist Brielle over a track with a cracking break beat and some slightly Caribbean undertones, while stepping into the realm of Hip House he provides a shuffling sub bass heavy background on “Hot Sauce” for Philly-based MC The Bul Bey to wax poetic about spicy condiments and the drive for success. As an added bonus, this release includes a special dubbed out remix of “I Found You”(feat. Dezaray Dawn), which was reworked by D.C.’s ambassadors of international beats, The Sol Power All-Stars. Osage (pronounced Oh-Sage) is the electronic music making alter ego of dj/producer lil’dave, a veteran DJ on the Philadelphia nightclub scene, a member of the highly respected dj crew Illvibe Collective and the co-host of the internationally known broadcast Eavesdrop Radio. As a recording artist, he has released music under various aliases for record labels such as BBE Records, Tru Thoughts, Record Breakin’ Music, Soulspazm, and First Word Records and collaborated with and remixed a diverse range of artists such as RJD2, Lady Alma, Ty, Ryat, Captain Planet, Foremost Poets, and more.